Mobile Banking means FREE1 access to your account anytime, anywhere, 24/7…all on your mobile device. View balances, see transaction history, deposit a check, pay bills, make a transfer, or find a location all on your phone! You can even quickly check your account balances without logging into the app on your device! It’s mobile Banking Simplified! With SCU Mobile Banking, you can easily view your account information by using the mobile web-based application available by accessing scu.org via a mobile device. If you are using an iPhone or Android device, you can download the free apps. 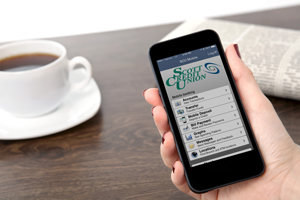 Simply search “Scott Credit Union” or “SCU Mobile” in the App Store or Google Play store. The mobile web-based application and the iPhone/Android apps are free1, fast, easy to use, and secure. Our newest addition to the app is Mobile Deposit, which will allow you to deposit checks through SCU Mobile! Mobile Deposit is only available to eligible members. Click here for the eligibility requirements for Mobile Deposit. To use SCU Mobile application, you will need to download it from the App Store for iOS devices or from Google Play for Android devices. On your first visit to the app, you will need to enroll to use SCU Mobile Banking. Enter the requested details and click on “Enroll”. Retrieve an access code from your email. It will be sent to the email address we have on record for your account. Return to your mobile browser, enter the access code and click on “Confirm”. Choose a new SCU Mobile username and password and then click on “Register”. Click here, to view some Helpful Hints about the SCU Mobile App! Once you have completed these steps, you will be able to log into SCU Mobile Banking! 1Your mobile service provider may charge Internet access fees. Web access is needed for SCU Mobile. Check with your service provider for details on specific fees and charges for mobile internet access. Can I use the same username and password as I do for SCU Online? Answer: As long as your username and password meets the minimum requirements for the new SCU Mobile app you may use the same username and password. However, as general internet security advice, we recommend never using the same password for multiple systems. Also, please remember that your username and password for SCU Online and SCU Mobile may be different with the new app. Will my SCU Online and SCU Mobile user name and password be different in the future? Answer: They indeed may always be different. Having different passwords for SCU Online and SCU Mobile will create another layer of security that will protect your financial information. If you choose to have them be different, remember that when you change your password in SCU Online, it will not change your SCU Mobile password. What should I do if all of my accounts are not showing up in SCU Mobile? Answer: If any accounts you have with joint account holders are not showing up on the application, please call our Member Service Center at 1-800-888-4728 . Our representatives will be able to get those accounts added so you can view them in SCU Mobile. What is the current version of SCU Mobile? Answer: How to verify your version: Launch your SCU Mobile application, near the bottom locate "About" and tap. Your app's current version will be displayed directly below the Scott Credit Union logo. How do I enable Quick Balance for my account? Tap it and your balances will appear. Why did Quick Balance stop functioning after I updated the app? Due to the security of the Quick Balance feature, some upgrades may require that the feature be re-authorized. To re-enable Quick Balance, simply go through the setup again. How do I enroll for SCU Mobile Bill Pay? There is no enrollment process for SCU Mobile Bill Pay. Once you have signed up in SCU Online Bill Pay, any activity set up there will automatically appear in SCU Mobile Bill Pay as well. Can I create a payee using SCU Mobile Bill Pay? You can now create a payee from SCU Mobile Bill Pay! This addition will allow you complete control of your bill payments through SCU Mobile! Why isn't Mobile Deposit showing up in my app? Mobile Deposit is not available to all members due to restrictions based on each member's individual account history. If you have any questions about mobile deposit eligibility, please contact our Member Service Center at 800-888-4728. What are the eligibility requirements for Mobile Deposit? Eligibility for Mobile Deposit for members of more than one year is based on your individual account history. Eligibility for new members (less than 1 year) is based on your credit score. If you have questions regarding your individual eligibility, please contact our Member Service Center at 800-888-4728. What should I do with the check once I have made a Mobile Deposit? After the item shows in your deposit history, write "Mobile Deposit" on the check in order to avoid confusion. Keep the paper check for 14 days after it is deposited. If there aren't any issues with the deposit, you may destroy the check. How long does it take to have a check reviewed? Checks deposited during business hours are reviewed the same day. Checks deposited after our normal business hours are reviewed the next business day. What happens when my check is rejected? If your check is rejected through mobile deposit and you believe this is in error, you may bring your check in to your nearest branch to have them attempt to make the deposit. Does SCU Mobile support Touch ID/Fingerprint Authorization? SCU Mobile now supports Touch ID on iOS and Android fingerprint capable devices. Upon your next visit to the app, Touch ID will now be enabled.